No, not if they scare me. It’s still a bad idea to walk on the roof of the playset. That will give me a heart attack. But trying new foods, new activities, new places– all those things are good even when you’re afraid of them. Molly’s face tells the story. 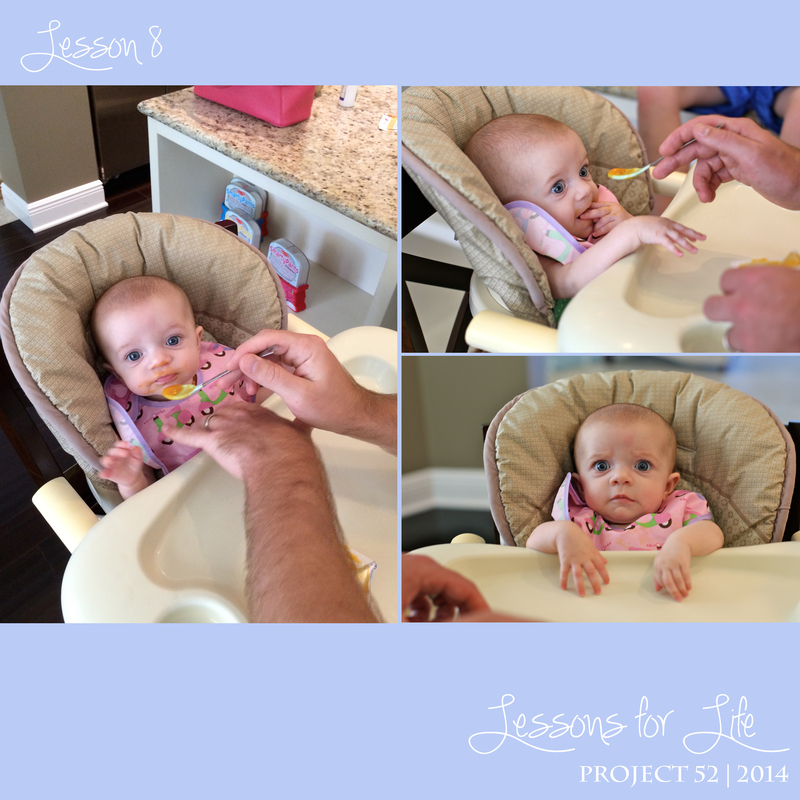 The bottom right picture shows her expression as we gathered around to watch her first bite of food. My kids have all made the most amusing faces for their first solid foods but Molly always wears a particularly expressive look and this time it said “What on earth are you doing now?” So she tasted her sweet potatoes– I guess you could now call that our family tradition first food. And she LOOOOOOOOOOVED them! She not only wanted to keep eating but she grabbed A’s hand and brought the spoon to her mouth as if to say “hurry up Daddy I want more!” In fact just 3 days in to the solid food thing she’s already finishing the container and wanting more and this makes me very happy since she’s not even on the growth chart anymore and spits up her milk so often that it’s a wonder she’s gaining weight at all. This just might save us all (and yes, no nasty emails, I know she still needs breastmilk and no I’m not replacing it yadda yadda yadda). So back to you kiddos… let this be a lesson for ya! Trying new things is a good thing. I can tell you that until I run out of breath but if your baby sister can handle it, I’m sure you older ones can too! Now go eat some squash or something!